Pomeroy, WA to Twin Falls, ID – I looked at a map and couldn’t tell where to go because I couldn’t tell where I wanted to go. Generally, I was Colorado-bound but now with no timeframe. I was lost. The dull reality of a hoped-for job possibly not working out meant I was a wanderer. I looked at the roads leading out of Pomeroy but had driven Hell’s Canyon, the most interesting road, two years ago. North to I-90 and through Missoula had already been done. The only destination I’d really missed on my drive west was Great Basin National Park, home of the bristlecone pines, the oldest living things on earth. I could take state route 12 to interstate 84 and decide if I wanted to cut south to the park there. I had seven-and-a-half hours to make up my mind. I pulled out of the Blue Mountain KOA at 9am looking for the deer someone had possibly hit with their car in the middle of the night. No deer. The Fish & Wildlife biologist in the KOA store had joked that I should’ve taken the back-straps before she arrived. I could just see myself driving across the country with a dead deer in my car. A wild turkey though? That was a more feasible option. Heading north on the Tucannon River Road, my GPS told me to turn left to catch state route 12. The road quickly became gravel. I couldn’t read the “Primitive Road” sign fast enough to know if I would need four-wheel drive or even to see where I was. The drought had caused all the blueberry bushes up the sides of the hills to turn bright red, a favorite color. The fruit on the elderberry trees, dusty purple, was ripe. My mind wandered to elderberry wine but I was too broody to spend time picking fruit — still, a wild turkey with a nice chutney? Eventually, I dropped into Waitsburg and Dixie, noticing my favorite winery: L’Ecole. I knew I was still into my thinking-space because stopping even there didn’t sound good. Along the Columbia River again, I waited for a construction crew to let me through somewhere outside of Umatilla on route 730. 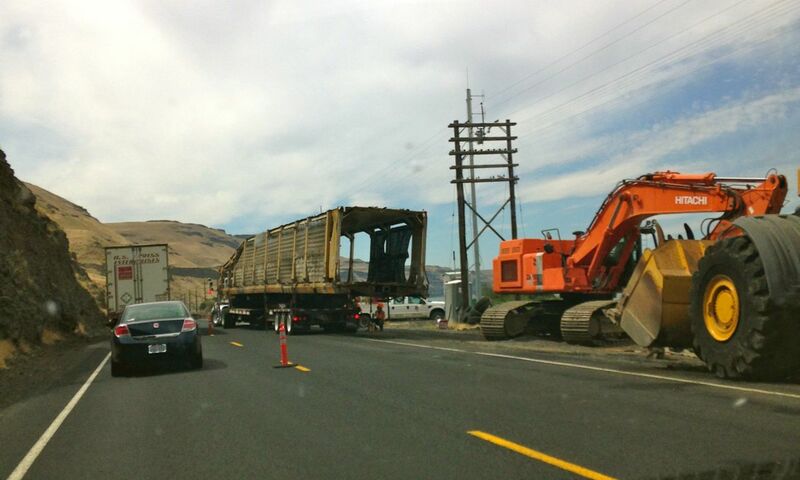 Union Pacific workers were using tractors to dismantle and load a derailed train onto semi trailers. I picked up I-84 and didn’t stop until Pendleton. Driving past the massive detention center after stopping for gas, I told myself I should be taking pictures, especially of a woman and her three kids running up to the covered, barbed wire entrance to the main building – who were they visiting? Even a Pendleton Wool Company stop sounded like too much. Drive through it, progress on the road is something. 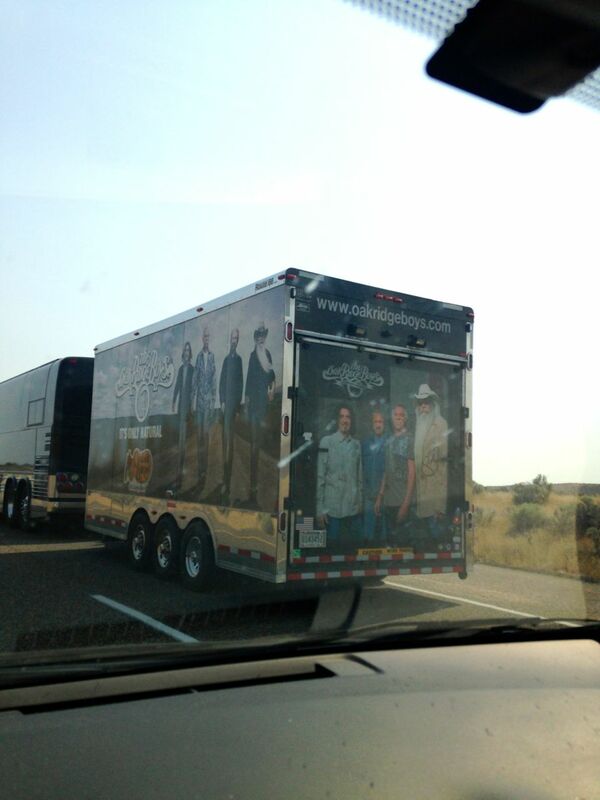 I drove on through Meacham, La Grande, Baker City and then passed the Oak Ridge Boys’ tour bus. They were a long way from home too. Memories of singing along to their record as a kid lifted my spirits some. I thought about following the bus until they stopped and offering to be their stagehand for whatever show they were playing that night – I had a black dress and heels. What a great story if I could pull it off but, still, I didn’t have it in me. It was back to the drawing board, potentially, with jobs. Maybe I’d become a writer after all. I tried to recite a poem I’d learned in 8th grade to get “Barbara Ann” out of my head (which I’d erroneously attributed to the Oak Ridge Boys). The only line from the poem that I could remember was, “generations have trod, have trod, have trod…” and something about being “bleared, smeared with toil”. I found myself repeating Shakespeare’s “out, out brief candle. Life is but a walking shadow…” Then I decided to rewrite Shel Silverstein’s “The Giving Tree” – as “The Not Co-Dependent Tree”. I wondered if the Silverstein family would see it as plagiarism. Really, the tree should’ve stood up for herself a little more. I understood the whole giving thing. I know lots of parents who like the book. I wonder if the tree, though, had her own dreams, if she always wanted to take a road trip, if she sometimes wished the boy would find other ways to get his needs met. There was, after all, enough to go around, to meet all needs. Here I was, planning to visit the oldest living things on earth – the bristlecone pines of Great Basin National Park – and thinking about the Giving Tree. I decided I had to see them tomorrow. I would camp in Twin Falls and drive south in the morning. 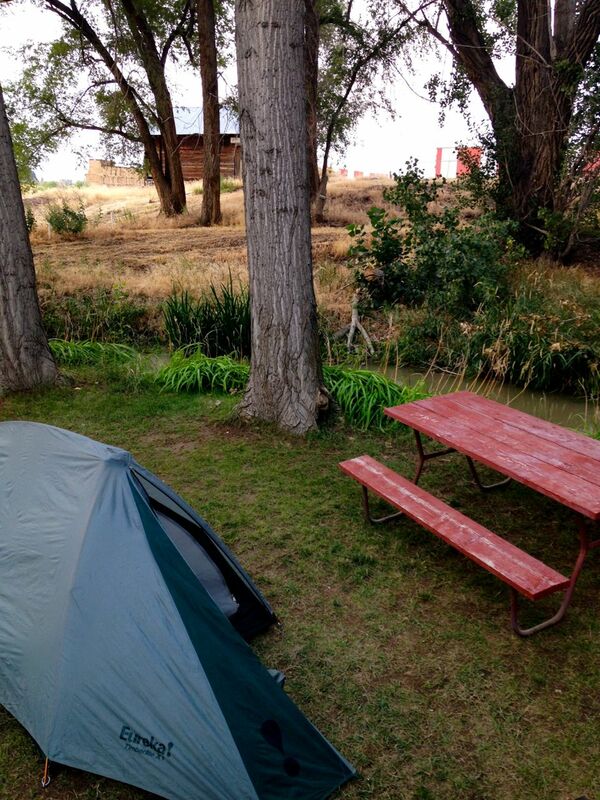 Faith in myself and my place on the map renewed, I pulled into the Twin Falls KOA – where no one had visited Great Basin National Park (what is it with this park?) – and set up camp next to the stream. It would be alright as long as there were still new places to explore. Which meant it would always be alright.